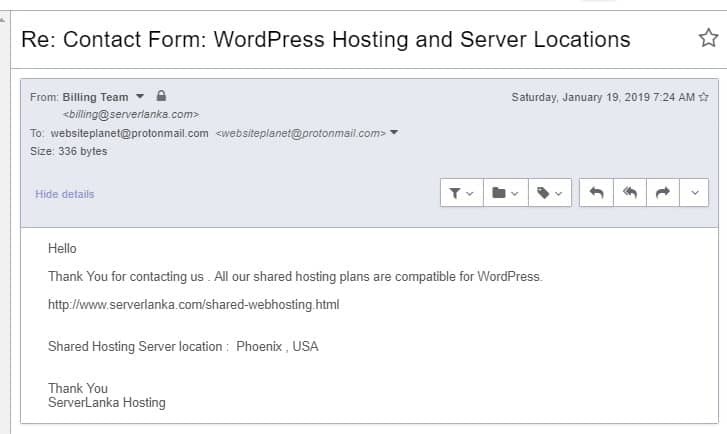 ServerLanka Review 2019: Is ServerLanka a Good Hosting? Known for low-cost hosting solutions that target small and medium-sized businesses, ServerLanka is a cheap web hosting provider based in Sri Lanka. Its services include shared web hosting and domain name registration. ServerLanka is Sri Lankan low-cost website hosting provider that provides shared web hosting, VPS, and dedicated servers. This firm uses modern hosting hardware and software in its main U.S. data center and elsewhere. ServerLanka’s data centers are equipped with the modern infrastructure that is monitored 24/7. The servers use CloudLinux with CageFS file system protection, pure SSD storage with RAID 10, and a high-speed 1 Gbps connection. Website loading speeds are therefore improved significantly. The hosting packages come with unlimited subdomains, unlimited bandwidth, and various disk space allocations of between 1GB and 20GB. They use the simple and user-friendly web-based cPanel control panel that comes with the Softaculous one-click installer with more than 300 pre-installed scripts for novice webmasters. ServerLanka performs automatic backups on a daily and weekly basis, with the R1Soft backup technology providing complete management of the data backups and restoration. These incremental backups provide high backup frequency without compromising server performance. ServerLanka’s hosting plans are very cheap and come with sufficient standard features for small and medium-sized businesses. This vendor offers two billing cycles – monthly and annual – and often gives new customers highly discounted introductory offers. You also get a free domain, but also suffer a setup fee that can be quite exorbitant. If you’re unsure about signing up, you’ll be pleased to hear that you get a 30-day test period within which you can request a refund if you’re not satisfied with the services. And there is an uptime guarantee of 99.9%. If you’d like to support yourself, you’re out of luck since this vendor’s knowledge base is virtually non-existent. ServerLanka’s cheap web hosting solutions coupled with its premium hosting features and responsive support team might make you think seriously about signing up, particularly if you have a small or medium-sized business that doesn’t require resource-intensive hosting solutions. Wondering how ServerLanka stacks up against other Web Hosting companies? Enter any other Web Hosting company and we will give you a side-by-side comparison.